Idiots! This neocon shambles have already, as first order of business, undone moves to remove tax concessions for the filthy rich! HBS Guy wrote: Are we headed for recession? The signs are not that encouraging. GDP may remain positive due to the enormously expanded resource output but it might feel like (and actually be) recessionary type conditions. It was easy throwing nasturtium at Swan from the Opposition benches—the dickheads never considered doing some detailed research & policy work. Now it is too late. Budget makes the deficit worse. Far flipping out, what incompetents! Hokey must be about to get the order of the boot else it will be monkey receiving that ancient order. Level of capital held by the banks to be raised seems to be key recommendation, with findings on improvements to superannuation and cost of credit cards also mentioned. The $7 copayment is gone. In its place is a $5 reduction in the medicare rebate. Still austerity, still trying to drive a wedge into Medicare to destroy it—one of the VERY best medical care systems anywhere! Can see people tuck away a bit more money to cover the extra cost of visiting the doctor. Longer term, if people put off seeing their GP then health care costs will increase. And the “price signal” is not needed—health spending is actually decreasing. The $7 Medicare co-payment measure announced in the 2014-15 Budget will no longer proceed. The Government will instead implement a package of measures that will strengthen Medicare and help make it sustainable, ensuring Australians will continue to have access to affordable, world-class health care. The Government has listened to the views of the community. This new package ensures the Government can make Medicare sustainable, improve the quality of care for patients and continue its repair of the Budget. The Medicare rebate paid to doctors for some consultations will be reduced by $5 and the troublesome issue of ‘six minute medicine’ will be addressed by encouraging doctors to spend more time with patients. A new optional co-payment will be introduced for GP services with additional protections for patients. The Government will not impose a co-payment on GP services provided to pensioners, Commonwealth concession card holders, all children under the age of 16, veterans funded through the Department of Veterans’ Affairs, attendances at residential aged care facilities and pathology and diagnostic imaging services. Incentives paid to doctors to encourage them to bulk bill concession card holders and children under the age of 16 will also remain. Medicare rebates for common GP consultations will be reduced by $5 for non-concessional patients aged 16 and over from 1 July 2015. Doctors may choose to recoup the $5 rebate reduction through an optional co-payment or continue to bulk bill non-concessional patients over the age of 16. Doctors will be under no obligation to charge the co-payment and this decision will be entirely at their discretion. The labour market didn’t get any worse in November but it also didn’t get any better. The risks to the labour market appear primarily on the downside -- particularly with regards to the mining and automobile industries -- and the Reserve Bank may need to provide greater stimulus to boost domestic demand and support the rebalancing process. On a trend basis, employment rose by 7,100 people in November, following growth of 7,300 in October, with growth stagnating somewhat over the past six months. The Australian economy has produced 133,500 new jobs over the past year, which remains well below the federal government’s five-year forecasts and is particularly low by historical standards. . . .
Part-time positions continue to drive employment growth. Part-time employment rose by 8,800 in November on a trend basis, while full-time positions fell by 1,700. The weakness in full-time positions has been among women (down 3,900 in November), while male full-time employment rose modestly. Part-time employment growth is concentrated mostly among women but there are gains among men as well. Really is rather unkind to Labor and Swan, too kind the Abbott & Hockey but at least the long term damage to the Budget done by Howard & Costello gets a mention tho—I have seen that being trotted out, finally, a couple of times now. Would have been nice if some of Swan’s efforts at cutting spending got a mention, like the cuts to the superannuation rort used by the super rich that got undone by the Libs in their first act on taking power. The NBN could have got a mention, it was one way to set the country up for the future but paying the debt the Tories owe Murdoch is more important. The Carbon Price and RET too are essential for the future in several ways—no mention. Guess Peter is sad he gets no more exclusives from Rudd or Abbott. This sort of article is what the bloody MSM should have been writing and publishing years ago FFS! The deficit figures INCLUDE all the “savings measures” stalled or knocked back by the Senate—so the real figure is worse than Hockey is saying it is. . . .Myefo encapsulates a policy agenda entrenched in the deficit reduction obsession, with little regard to the challenges unfolding in the real economy. Those challenges are a slowing growth rate, falling national income and rising unemployment. Heath Aston springs Hockey on another backflip. Page 117 of MYEFO reveals that now they are NOT going after mulinationals’ rampant tax avoidance. I suppose there are far easier targets in the community. The Russian rouble is in free fall. I remember reading some saying the sanctions imposed by the west because of Ukraine wouldn’t work. Maybe Putin should concentrate more on diversifying and strengthening the Russian economy—guess they like us are suffering from the “Dutch disease” of mining crowding out other parts of the economy. Many more job losses predicted by Treasury for next year. And it is likely that younger workers will bear the brunt. 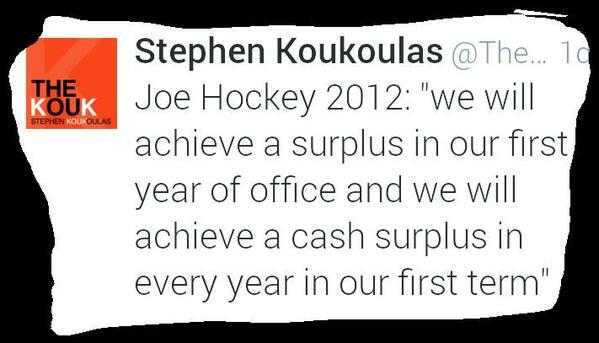 Time to dump Hockey, dump the Libs and try and get the nation working instead of chasing the mirage of a surplus. Maybe, just maybe, the economic outlook is grim enough a unity government should be formed but there is nobody in the ranks of the Libs with the competence and mental agility for them to change course. It really is a bloody awful government we have, talentless, incompetent and mentally rigid just when we face a grim outlook for the world economy. Hockey doesn't seem to have any interest in the welfare of ordinary people. I don't think any sanctions should have been imposed against Russia, and if they have resulted in a rouble crash that is heaps bad. As far as I can see there is no evidence they have any involvement in shooting down the aeroplane that was shot down over the Ukraine. Also, what on earth would be their motive? Hokey is a weak, fat pig and too gutless to tackle those who can fight back. A disgrace of a Treasurer, we will talk of the Hokey Depression for decades. It probably was a Russian missile fired by insurgents that shot down MH017—it had been rerouted to avoid a storm and came so followed the same path 2 ukrainian govt cargo planes. Dunno where the missiles came from, direct from Russia or from that Ukrainian base the rebels had over run earlier. Yep some more tax cuts for high income earners and an increase to the GST is needed to kick start the economy. Tax cuts to the rich—get saved. This high indebtedness was due to Howard & Costello encouraging and feeding a credit fuelled real estate boom. Let us not have booms just prosperity for all. Until the hamfisted shambles came in the savings rate was slowing down but now it is high again—mirroring the falls in confidence the idiots caused. We can reverse the last 3 cuts to the upper brackets, we can get rid of the tax expenditures, tighten up the FBT and tighten up the Old Age Pension so asset millionaires are not receiving public benefits. That will see the Budget in a healthier state. Those you call ochlocrats are actually paying benefits to the super rich. Remember the 70 millionaires paying zero or trivial amounts of tax? The ochlocrats are probably not where you think they are. The shambles hate science, they have also destroyed the NBN. How the hell can we move to general prosperity with a government like this? We can’t! They rule for the 1% who will not invest in Australia. First comment by Peter Martin! Rich tax evaders and avoiders—cost ALL of us big time!